Danger Lurks in Your Studio! Disclaimer: if stories about blood make you faint, read no further in this post. There is danger lurking in your studio … things that will jump out and attack you! Most of us are familiar … sometimes too familiar … with the usual hazards … needles, scissors, rotary blades. If you haven’t been stabbed or cut at least once in creating a major work, you’re lucky. I have a friend who had to go to emergency because she sewed through her finger. And another had to leave a class early because she lopped off the end of her finger with a rotary blade. Ouch! First of all you have to keep in mind that this probably won’t happen to astute artists as you are, but I’m rather a Klotz. I also have very thin skin and have sheared it off of my leg before … and at an art quilt meeting, as some of you will remember. The ruler was sitting on the floor propped up against one of the legs of my sewing table. I was using it to measure as I machine quilted a piece. I turned in my chair apparently catching my leg on the corner of the ruler and slashed a right angle cut on my leg. Blood all over the place, fortunately not on my work though for just a minute I was tempted to use it to stop the flow. I yelled for my husband. He was upstairs watching a ball game on TV, actually dozing. By the time he responded, there was blood in several places on my studio carpet, and the Kleenex box was empty. Several bandages later my leg was bound, and I was propped up on the couch with it elevated and a non-lethal book to read. My leg is now in the process of healing. I’ve¬¬ even done some more quilting on the piece but with a cloth measuring tape instead of the plastic ruler. Yes, we should have a first aid kit in our studio … in addition to a large box of Kleenex. Keep making art … and keep safe! How productive were you in the past 12 months? I was considering this the other day as I prepared for a workshop with Nancy Crow. She challenged us last year to bring in 40 new works and bragged by saying she has 50 done. I was chagrined to discover, when looking at my quilt log data base, that I completed only two in 2012, and those were both begun in 2011. So, I thought to myself what HAVE I been doing. I know – as well as you – that I haven’t been writing my blog. 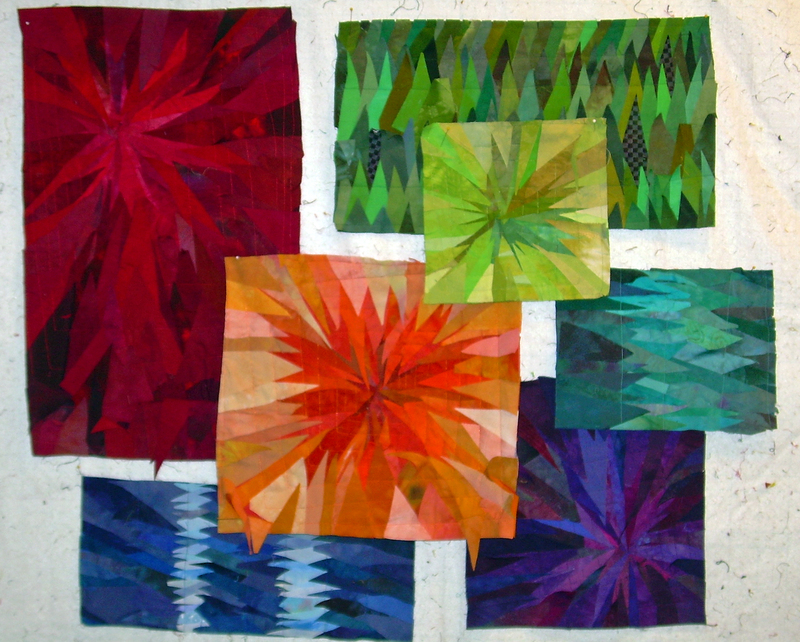 I have done several charity quilts. We traveled quite a bit – to Australia for five weeks, Hawaii for three. I have done quite a bit of knitting and reading. I have dealt with some health issues. And so forth. Then I thought WHY have I not been creating new work? I looked at my calendar and found that my time has been fragmented – doctor appointments, singing, social outings, church work, and so forth. But, I think there is something more. After working rather intently on my “Sticks” series I have come to a block. Should I continue with this series? Should I “revisit” former series? Should I do something new? 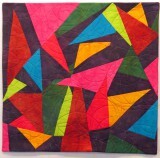 I’m inspired by recent articles in Surface Design Journal and Quilting Arts to go in new directions. I’m beginning one and, of course, have several in my head. It’s time to set aside time and get to work in my studio. Wish me luck! I’ve missed chatting with you, but I’m not going to list excuses. We all have them, and – I hope – you’re here to share what I’ve been doing in the studio. One side note – my husband and I spent the month of April in Australia visiting family and touring. Will the beauty – and friendliness – of this country influence my work? That is yet to be seen. In the meantime there’s activity in my “Sticks” series. As I mentioned, this series originated from a Nancy Crow workshop in 2011. In the 2012 workshop I did Nancy’s new exercises but continued in the same series. The result is three new Sticks. 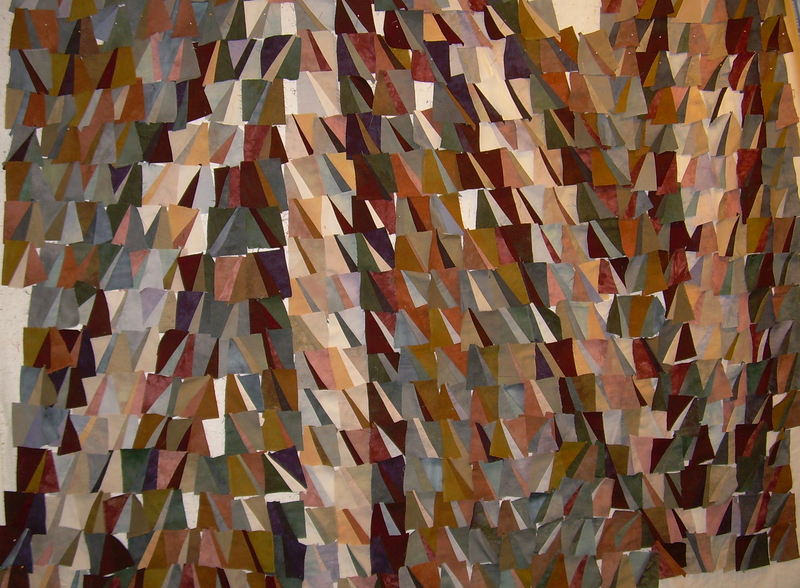 The quilt tops I do in workshops are never finished products – far from it! They are learning tools that sometimes – in this case, two out of three – become new works. 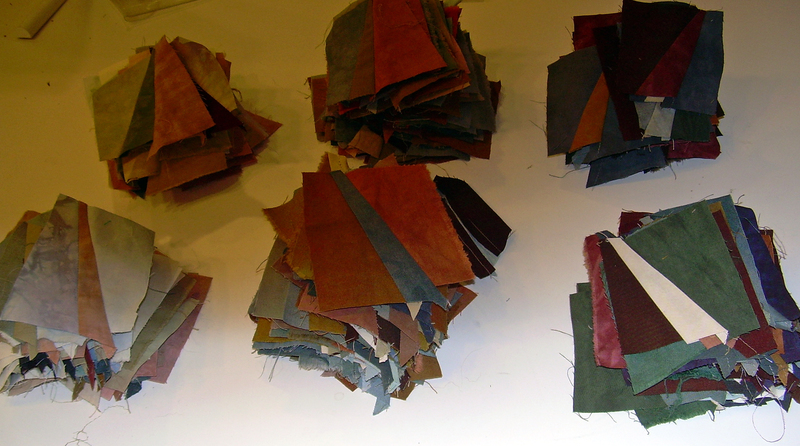 Two of the exercises I brought home, took apart, inserted new colors and reconfigured before I was satisfied with them. Here are the results, as yet unnamed. Suggestions are welcome. What I did on this one was add some lines and lighten colors in the center, which was rather muddled. 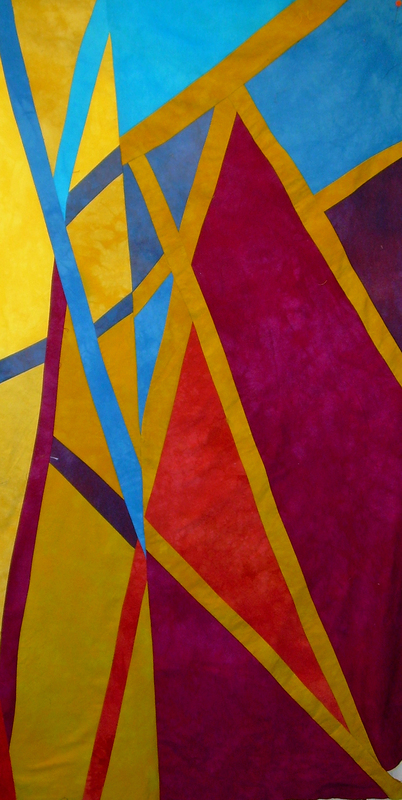 On this one the lines were originally black on the left (yellow) slide. I changed them so that it brought some of the colors from the right into the left side. So what happened to the third sticks exercise? 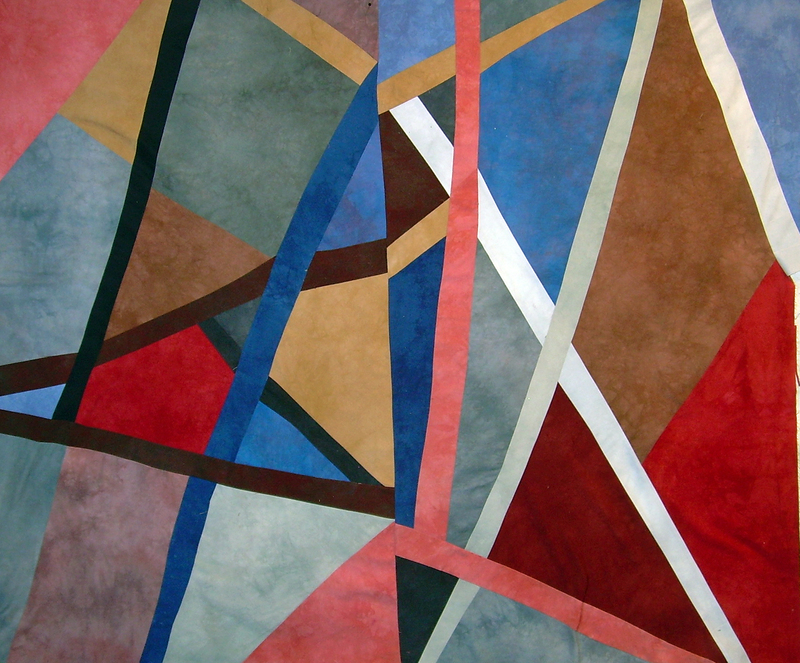 I chose to work with smaller shapes – or perhaps that was the assignment, I don’t recall. I also decided to work in a relatively neutral palate. Why do I challenge myself and, after much frustration, come out with zilch? Do you ever do that? I cut hundreds of 3-inch squares in neutrals, slashed them diagonally, inserted a neutral strip in the middle and sewed them together. Here are the stacks: When I started putting them up on the wall, I started arranging the squares, which after piecing were irregular rectangles. I put them together as light, medium and dark in an all-over pattern resembling chopsticks. Aha! A name – Chop-ed Sticks. Then I started to sew them together. Ack! 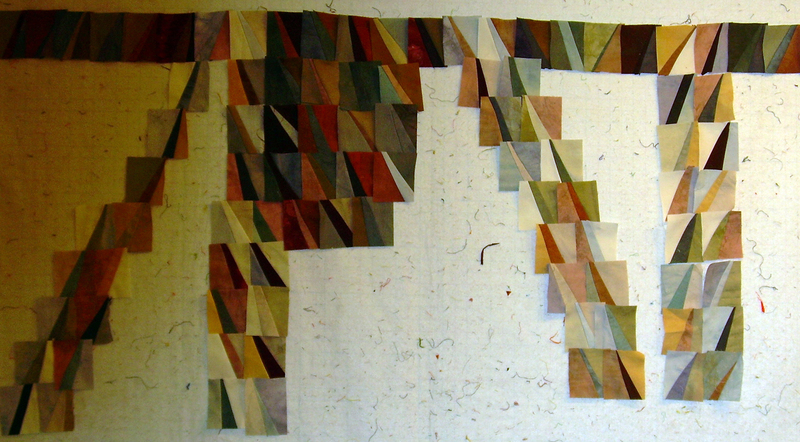 The squares – cut and pieced improvisationally – looked good on the wall, but sewing them together was awful. The edges didn’t match; none of them were the same size. I know how to fix that in larger pieces, but these were so small it became frustrating. I decided the only way was to trim the blocks to a common size – 2 ½ inches wide by 3 inches tall. When I put them up on the wall, they fit easily together, but something was definitely wrong. They were too structured! They weren’t “me!” I took them all down, put them in a bag and relegated them to the UFO basket. I didn’t have a pity party, Jeanette, but I did eat chocolate. When we fail, it isn’t satisfying. But when we fail, we often learn a lesson about ourselves. I like to work with larger pieces of fabric. I don’t like to work in “blocks.” I like to work improvisationally. I don’t like to match my points and have everything even. Did I know this before? Of course! Every once in awhile I just have to prove it to myself … again. Here’s to more successes and fewer failures … for all of us! Enter your email address to subscribe to this blog and receive notifications about new exhibits and works via email. All images and text are © copyright Melisse Laing. Reproduction of any kind is expressly prohibited without written consent.